SAN JUAN -- Again, forty minutes were not enough. Archrivals San Beda and Letran traded haymakers althroughout the game but it was the poise of the defending NCAA champions that prevailed in overtime, 80-76 to cap off the Friday tripleheaders of the men's basketball tournament tonight at the FilOil-FlyingV Centre. The Red Lions saw their eleven point lead in regulation disappear with just 3.8 seconds remaining on a Jerick Balanza jumper, but Donald Tankoua forced the extra session with his undergoal stab with just 0.2 left. Then the shootout continued there, where it was nip and tuck until Tankoua gave them the lead for good with another close-ranged shot, 41.8 ticks remaining to improve their clean slate with their fifth straight win of the season. Robert Bolick lead the Red Lions with a rare double-double of 20 points and 11 rebounds, with regulation hero Tankoua chipping in a double-double of 11 and 13 as well. 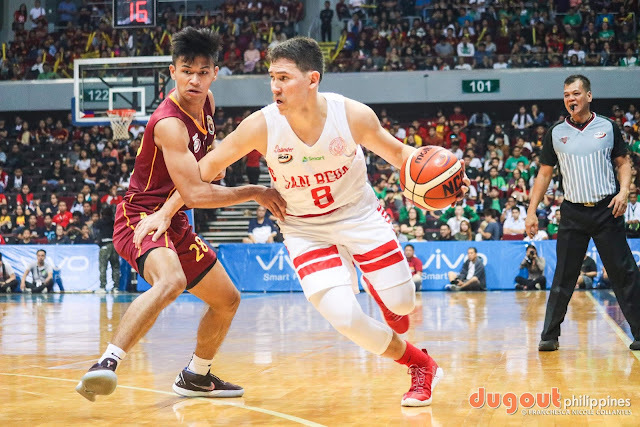 San Beda found its range from beyond the long line, with Clint Doliguez making a quarter of the team's 12 triples made all game as the champions got through the eye of the needle to get the gut-wrenching W.
Bong Quinto led the vanquished Knights with 21 points on a 9/22 clip from inside the arc, as they were a huge part of the 46% of the makes there. The senior swingman also hauled 11 boards for a double-double, five of them on the offensive end. San Beda 80 -- Bolick 20, Doliguez 11, Tankoua 11, Mocon 7, Oftana 6, Soberano 6, Canlas 4, Nelle 4, Presbitero 4, Tongco 3, Abuda 2, Carino 2, Cuntapay 0. Letran 76 -- Quinto 21, Calvo 14, Ambohot 13, Balanza 11, Fajarito 10, Muyang 5, Taladua 2, Agbong 0, Balagasay 0, Batiller 0, Mandreza 0, Yu 0. Quarter scores: 17-14, 35-29, 53-44, 69-69, 80-76.